What Do I Feed My Gluten Free Guest? At two different points in my life doctors suspected I might have celiac disease, the auto-immune disease that means you can’t eat bread. It turns out I had Crohn’s, a different auto-immune disease. Crohn’s is also not a laughing matter, but basically all I wanted clarified at first was, “Yeah, but I can eat bread with this one, right? I can eat bread, RIGHT? !” Such is my love for bread. Because of this, I have the deepest sympathy for those who do have celiac or are gluten intolerant. However, as a hostess, I know the challenge of having a group of people over for dinner and then finding out one of them is gluten free. I don’t want to end up making two different meals and bringing attention to the gluten free guest, who probably gets really tired of feeling like food defines him/her. Lately, I’ve been trying to find start-to-finish menus that everyone can eat, but won’t have the gluten-eaters wrinkling up their noses. I understand that, too. I’ve eaten a lot of gluten free baked goods that only politeness kept me from spitting right back out. 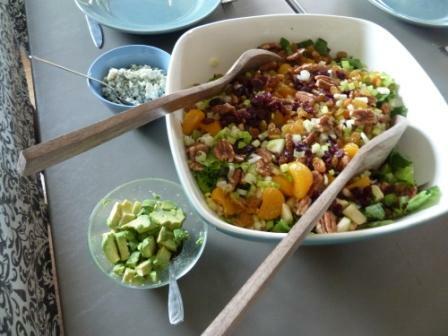 Making a meal that all the guests can eat serves two purposes. First, you don’t have to cook twice. Also, it means there’s less risk some stray gluten will make its way to your GF guest’s food and make them sick through cross contamination. So do I have to buy a bunch of specialty stuff that will just rot in my pantry after that? Nope. Instead of trying to make spaghetti and meatballs with garlic bread gluten free, subbing in all kinds of flours and pastas you don’t necessarily know anything about, just focus on serving naturally gluten free foods. Most people have mild panic just trying to figure out what to feed their family on a weekly basis without restrictions. Admittedly, when I first started trying to cook for gluten free folks, my brain would freeze up and all I could think of was bread-laden dishes. To help you with the brain freeze, here’s some suggestions. 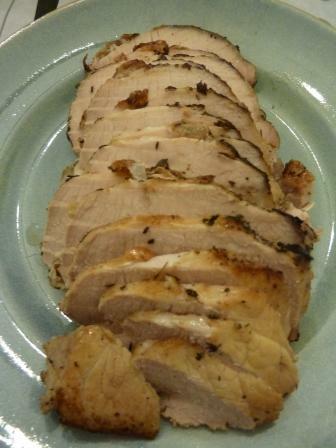 Grilled and roasted meat is easy and gluten free, like this pork roast. Anything that’s mainly just meat will work. Think like a good Midwesterner here. Grilled steak, chicken, pork chops, ribs, shrimp on the barbie, etc. are all fine. Just make sure if you’re using a store-bought marinade that the manufacture didn’t sneak some gluten in. A good roast (beef, pork, or whole chicken) also will work. Pork tenderloin can be made up in countless delicious ways. I have a pan seared salmon recipe with a tomato relish that’s fantastic with no gluten anywhere. In fact, most of my seafood recipes don’t have any bread aside from my crab cakes. Unless your chili recipe has some odd stuff in it, it’s probably gluten free, too. Double check your sauces, but a lot of Asian food is gluten free. 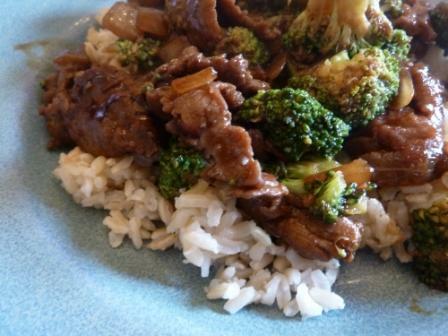 Try this Beef & Broccoli. Also think international food. Most other cultures aren’t quite as bread obsessed as ours. Make a stir fry or curry and serve it over rice. You can make most any Mexican food (tacos, quesadillas, enchiladas); just make sure you use corn tortillas or hard corn shells instead of flour tortillas. Read your labels, though. For some reason, manufactures will sometimes slip regular flour into corn based products. Not all tortilla chips are gluten free. In addition to starches and veggies, don’t forget our friends legumes. 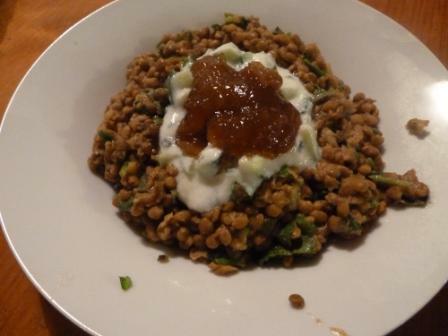 Try this Indian spiced lentil dish. I often revert back to my Midwestern roots again here. Most of my dinners growing up involved a good hunk of meat, a starch, and a green veggie of some sort. If you’ve gone the grilled or roasted meat route for your main dish, this isn’t a bad example to follow. For a starch, here are some basics open to you: baked potato, baked sweet potato, some sort of oven fries (check the package if you’re buying a bag from the freezer section, though), a rice dish, quinoa, potato salad, chips, and mashed potatoes (again, if you’re doing instant or buying a gravy look at your labels, though). Don’t serve couscous, though. Couscous is wheat. If you’re ever worried a salad topping or dressing isn’t GF, just serve it on the side. All vegetables start out gluten free, it’s just turning them into casseroles or adding cheesy breadcrumbs or something when you have a problem. It also makes them pretty unhealthy. Keep your veggie prep simple and read the labels of anything you add to them, and you should be fine. Be mindful of salad dressings, which often are hiding gluten. Also, if you are planning on serving a salad with croutons, chow mein noodles, etc. keep them in a bowl on the side so they don’t contaminate the whole salad. This is where things can get heated. You bring out a gluten free dessert and the gluten eaters will start giving you the stink eye. Previously, I’ve made a “real” dessert, and then tried to have a little something for my gluten free person, but I’ll be honest, the GF offering was sad. You can give your GF guest the nicest bowl of fruit ever, but if everyone else is eating triple chocolate brownies, that’s just mean. The easiest thing, again, is to opt for the naturally gluten free option. Most ice cream, sorbet, and gelato flavors are gluten free. Occasionally if the ice cream has chunks of pie crust or cookies or something it’s not gluten free, but most of them are. I dare a group of gluten eaters to give you the stink eye when you offer them the fixin’s to make ice cream sundaes for dessert. There are some good GF baked goods out there. If I don’t think they taste good enough, I won’t ever post them. 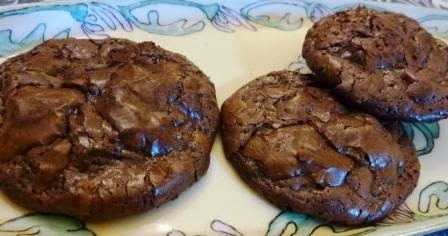 If you really want to offer a baked good, I’ve done a little bit of experimenting with some GF recipes, and I can guarantee you that these two cookie recipes are good. I’ve had both more than once because I liked them well enough that I made them just because I wanted some, not because I had a GF person to feed. Best of all, neither of them require buying any specialty flours. All links are to my recipe blog. Easy Weekday Dinner: Hard shell taco bar with ground beef seasoned with McCormick’s taco seasoning (GF), shredded cheddar, tomatoes, lettuce, sour cream, salsa, refried beans (most brands are GF) & guacamole. Peanut butter cookies for dessert. Still have questions? Put them in the comments section, or use my contact me form. Have another hard to feed guest? Ask, and I’ll see if I can help. Gluten-free readers, do you have anything to add? ← So Are You Still Writing or What? Ah, the trick is a GF Vegetarian! Still doable, and we definitely rely a lot of asian food to cook for our friends and a family member who need GF. Asian is fairly easy to not miss the meat. Thanks Lara! I miss your baked goods. I’m thinking about doing a what do I feed my vegetarian post at some point, too. The ones that double up are the hardest. I might even do a what do I feed my guest that can’t eat gluten, dairy, eggs, nuts, or soy? Granted, I only know one of them, but when you are confronted with that, you need help!